SAN FRANCISCO – I miss so many things about Hong Kong: the perfectly temp-controlled, the over-the-top shopping malls, that incredible skyline (one of the best, up there with Chicago), the blunt and often endearing pessimism of the locals (who claim “HK died in 1997”). I even miss the city’s fascinating (and often frustrating) yin and yang aspects – super efficient airport vs. the wildly chaotic taxis, “real” Kowloon vs. “fake” HK Island, British vs. China rule. And then there’s the food. Oh, the food. It’s the first thing that comes to mind when I think of Hong Kong – ridiculous Shanghainese soup dumplings, succulent Beijing roast duck, amazing Chiu Chow style braised goose and fresh crabs, and some of the best dim sum ever. But most of all, I’m reminded of Cha Chaan Teng (aka CCT) food, my favorite kind of Hong Kong cuisine. You’ve already heard from me about CCT food (see Hong Kong: Cha Chaan Teng), so I won’t go into all the details again. But for the uninitiated, here’s the short version: the CCT is the Hong Kong equivalent of a diner or coffee shop and is known for serving Western-influenced Chinese dishes (or visa versa depending on the dish). The food itself is comfort-y, lowbrow, super tasty and I love it. Unfortunately for those of us living outside of Hong Kong, finding any CCT – let alone a good one – can be a challenge. They just haven’t caught on elsewhere unlike, say the Japanese izakaya. However, thanks to a friend (a HK local and someone who’s familiar with my CCT tendencies), I recently discovered what might be one of the best CCT joints west of the Pacific: Café New Honolulu. What makes Café New Honolulu so good? Well, it’s not the moniker (which has nothing to do with its namesake) but rather its level of authenticity. Café New Honolulu has got the Hong Kong CCT thing down to a tee, which is surprising mainly because most ethnic food, once it migrates, tends to get ‘tweaked’ in ways that lessen the original (e.g. most Japanese ramen shops in NYC, except maybe Ippudo in the East Village). Fortunately, with Café New Honolulu, all the usual CCT elements are present and accounted for – tea-stained mugs, gaudy interiors (of faux-sky ceiling tiles, walls plastered with food pics and posters listing weekly specials handwritten in Chinese), and most importantly, loads of fun, tasty menu options, from breakfast and freshly baked buns to noodle dishes and European inspired entrees. It’s even got the attractive inexpensive prices and not so attractive, crappy (but very efficient) table service that the CCT is known for. So, what to order at Café New Honolulu? There are loads to choose from and this is another thing I like about this place – there’s something to suit almost any pallet or mood. If you’re in a breakfast state of mind (like I often am) try their CCT version: couple of eggs (made however you like ‘em), a bit of meat (usually ham), a freshly baked sweet bun, and a side of instant ramen noodles in soup topped with a heaping portion of beef satay; all accompanied by a mug of piping hot, sweetened milk tea. If you feel like going the more Asian-y route, try the very popular fish meatball noodle soup (it goes great with a cool glass of iced lemon tea, at least according to my friend Zoe). 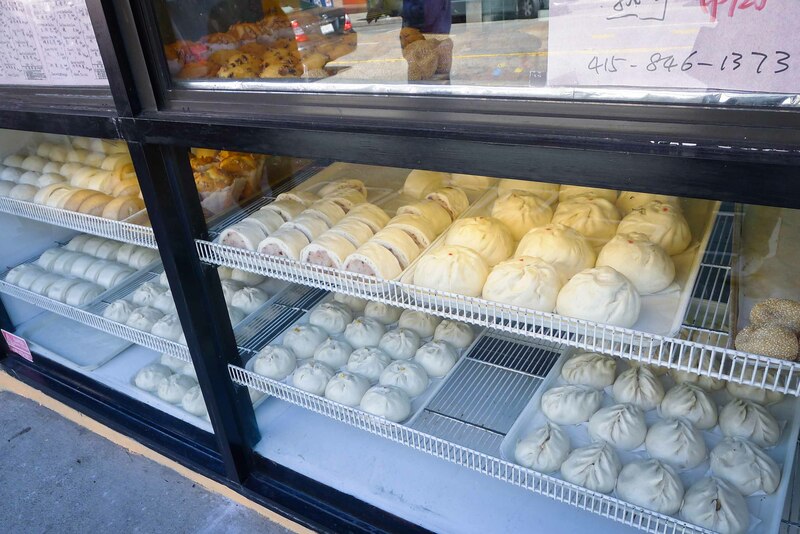 Or if you’re in the mood for something more dim sum-ish, Café New Honolulu also does a nice selection of freshly baked buns (both sweet and savory options but be sure to try the pineapple buns), which go great with the aforementioned milk tea. As to the western inspired dishes, Café New Honolulu also serves up loads of steak, pork chop, ox tail and seafood options, some of which are baked in a rich cream sauce, while others are served with a rich brown gravy and some sort of veg. And yes, all of these dishes come with rice or spaghetti. I can go on and on about the food at Café New Honolulu but I won’t. You get the idea – loads of food choices, some Chinese and some Western, but all super tasty. It goes without saying that Café New Honolulu has become my new must-have when I’m in San Francisco…sorry Tommy’s Joynt. What’s the little thing that makes Café New Honolulu worth a visit? 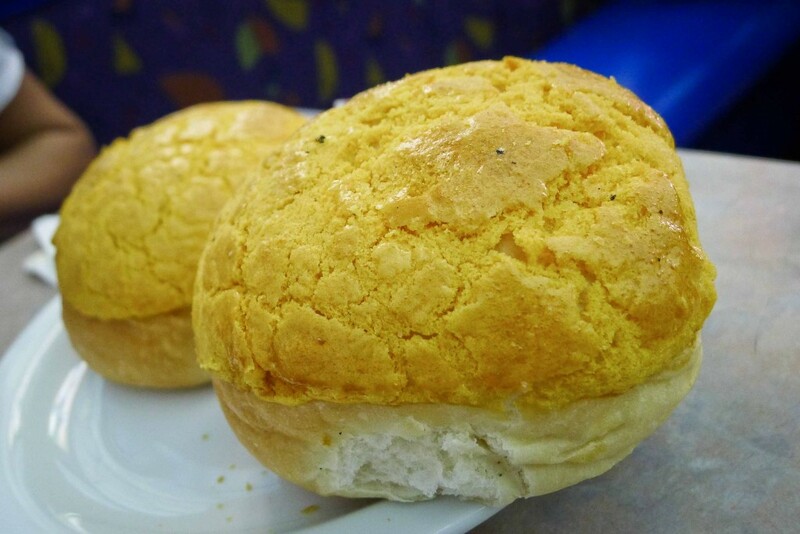 It’s authentic Hong Kong comfort food; the CCT style breakfast and the freshly baked buns. Where is it? 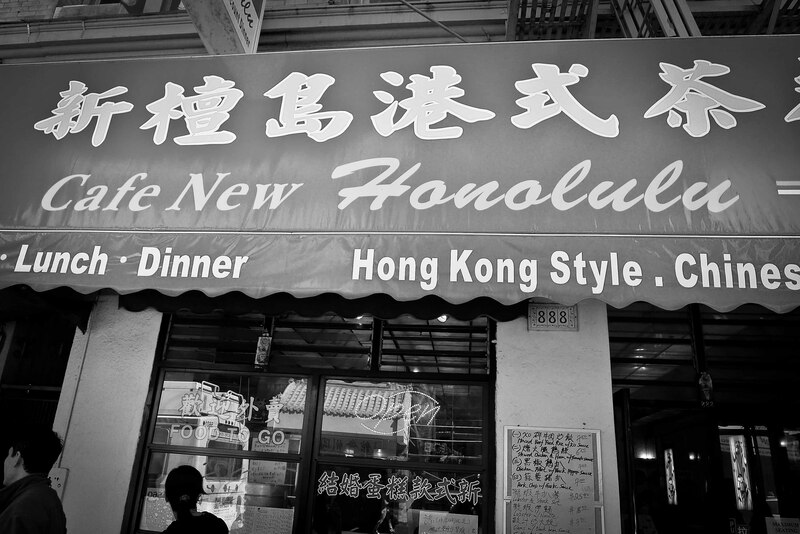 Café New Honolulu is located in San Francisco’s Chinatown at 888 Stockton Street (at Clay). Prices: Most menu items are in the US$5 to $8 price range. They also have a fun teatime menu (3pm – 6pm) of light snacks (e.g., HK style fried chicken wings, beef and egg sandwiches, French toast, etc.) each for $4.